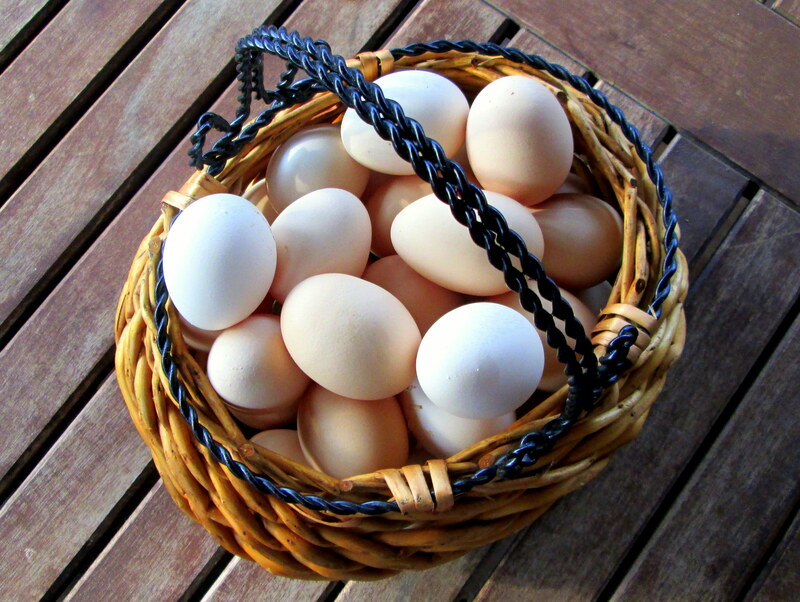 Here are about two dozen reasons to raise backyard chickens. It seems that everybody is jumping on the backyard chicken bandwagon these days. If you don’t raise chickens yourself, I bet you know someone who does. And if you don’t know anyone personally, here are some names you may recognize: Julia Roberts, Jennifer Aniston, and Reese Witherspoon. Yes, all of these A-list celebrities keep chickens. While raising chickens may not be for everyone (and I will cover some considerations before getting chickens in a future blog post), if you are at all intrigued by the idea, my list of five reasons to raise chickens should give you something more to think about. For me, I always viewed raising chickens as a natural extension of growing my own food – an extreme form of gardening. I even refer to the chicken pen as my egg garden. And, unlike my vegetable garden, my egg garden continues to produce after a frost. So it is no surprise that my number one reason for raising chickens is for the eggs. I simply love having a healthy source of protein just steps outside my kitchen door. It really is true that eggs taste better when they come from backyard chickens. They look better, too, with darker, perkier yolks than what you find when you crack open a store-bought egg. There is a reason for these very real differences: diet. Chickens that are allowed to roam and eat a natural diet of vegetation, bugs, worms and grubs have better looking and tasting eggs. They also produce eggs that are healthier for you, with less cholesterol and saturated fat and more Vitamins A and E, omega-3 fatty acids, and beta-carotene than factory-farmed eggs. I never realized what great pets chickens made until I had my own. They each have their own little personalities and quirks; they all provide hours of entertainment. I love how they come running to the gate to greet me each time I go out to see them, and I love the sweet little clucking noises they make when I tell them goodnight when I lock them up at the end of the day. They eat treats right out of my hand. I’ve even taught them some rudimentary tricks. There is a symbiotic relationship between my egg garden and my vegetable garden. I feed the chickens waste from the garden – lettuce that has bolted, carrot tops that we aren’t going to eat, cucumbers and zucchinis that we missed until they got too big. 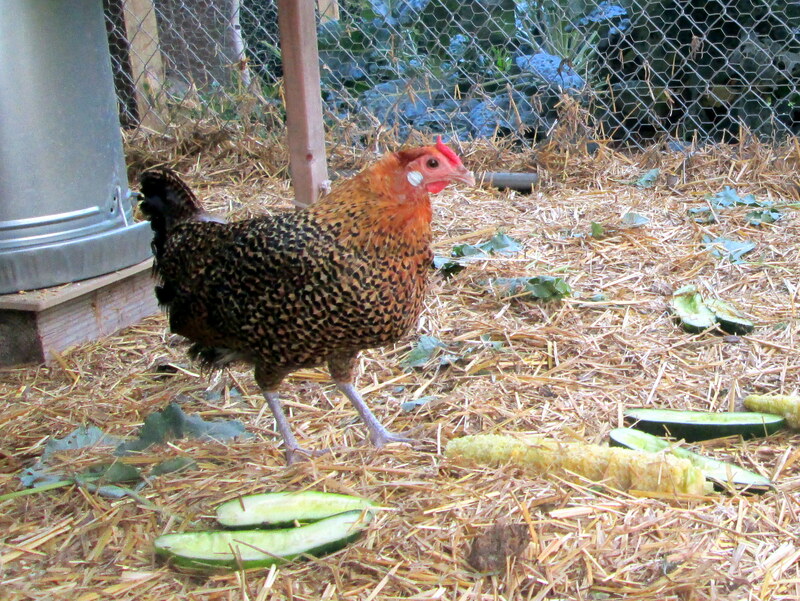 In return, chicken waste and the discarded straw and wood chips from their pen and coop go into the compost pile and, eventually, back into the garden in the form of nutrient-dense compost. Hazel dining on kitchen and garden scraps. Simply put, the hens used in industrial egg production lead miserable lives. They are crammed together in wire cages without enough room to spread their wings, much less engage in their natural chicken behaviors. They can’t scratch and peck or nest and roost; they can only eat, drink, defecate, and lay eggs. Their sensitive beaks are clipped to prevent the stressed birds from pecking each other. And when they are deemed past the point of optimal egg-laying productivity (around the age of 18 months, even though hens will keep laying for as long as 5 or 6 years), they are sent for slaughter. Again, don’t take my word for it. This video excerpt from the Discovery Channel program “How Its Made” shows you just how those factory-farmed eggs end up in the grocery store. If this is upsetting to you, consider raising your own happy hens for eggs, or at least purchasing your eggs from a family farm where hens are raised in a humane manner. There are only a few specialized breeds used in the poultry industry – in the case of egg production, those that are high-volume layers – yet there are hundreds of breeds of chickens in existence. In the United States, more than 40 breeds are in danger of become extinct. According to The Livestock Conservancy, 12 of those breeds are “critical,” meaning five or fewer breeding flocks remain in the United States. By raising your own chickens, you can help to preserve these rare, heritage breeds for future generations. Do you raise chickens? If so, what are your reasons? Please share your experiences in the comments section below. This entry was posted in Raising Chickens and tagged backyard chickens, benefits of chickens, suburban chickens by Deborah Neyens. Bookmark the permalink.